Square Knotting, (a.k.a. the Cobra Stitch) Instructions below will make one knotted cord, about 3 inches (2.5 cm) long using plastic lacing. Two 1 foot strands of plastic lacing = about 1" of stitches or knots. Fig. 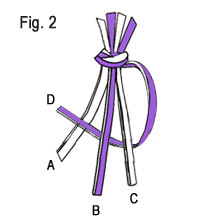 1- Gather 4 pieces of Rexlace and tie them together making an overhand knot on one end. Fan the pieces out so that the colors alternate. It may be easiest to letter or number each strand to help you follow along. Fig. 2- Fold strand D behind strands C and B. Cross strand D over strand A. Fig. 3- Cross strand A over strand B and C. Slip strand A behind strand D. Pull tightly on strands A and D. Make sure the stitch is pushed up to the top knot. Keep strands B and C straight. Fig. 4- For the next stitch, cross strand A over strand C and B. Slip strand A under strand D.
Fig. 5- Fold strand D behind strand B and C. Cross strand D over strand A. Pull tightly on strands A and D. Make sure the stitch is pushed up to the top knot. Keep strands B and C straight. Fig. 6- Now you have two completed stitches. Follow the pattern again, starting over again with step two. 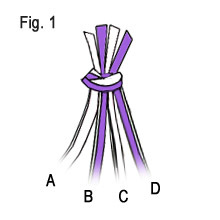 Once you have achieved the desired length, secure the ends with an overhand knot. Trim excess Rexlace strands, leaving a small tail.